It is an exciting time to be a part of the Removal and Storage industry. Houses are selling again, Houses are being built again. The subsequent economic rise has always had a beneficial effect on moving companies in Ireland. And with this, there are fantastic opportunities right now to become part of the Aaltonen team. We are always on the lookout to hire genuinely hard-working, talented employees. Even at times when we are at full capacity with staff, we are continuously accepting CV’s to make sure we never allow a talented removalist or office admin, slip through our net. During our continued progression, we constantly look to attract the creme de la creme of experienced men and women within the industry. And we are also casting a watchful eye on potential candidates to provide training to, in the hope that they become part of the 40-year history here at Aaltonen. At the time of writing, our staff has a combined experience of 130 years in this business. And we are looking to add to that. So what does it take to be an Aaltonen team member? I love the challenge and I embrace it. It relieves a ton of anxiety or stress I may have built up or neglected to deal with. The joy of being able to meet new customers and travelling to new places is a dream come through. Particularly coming from a systematic cubicle-farm environment. 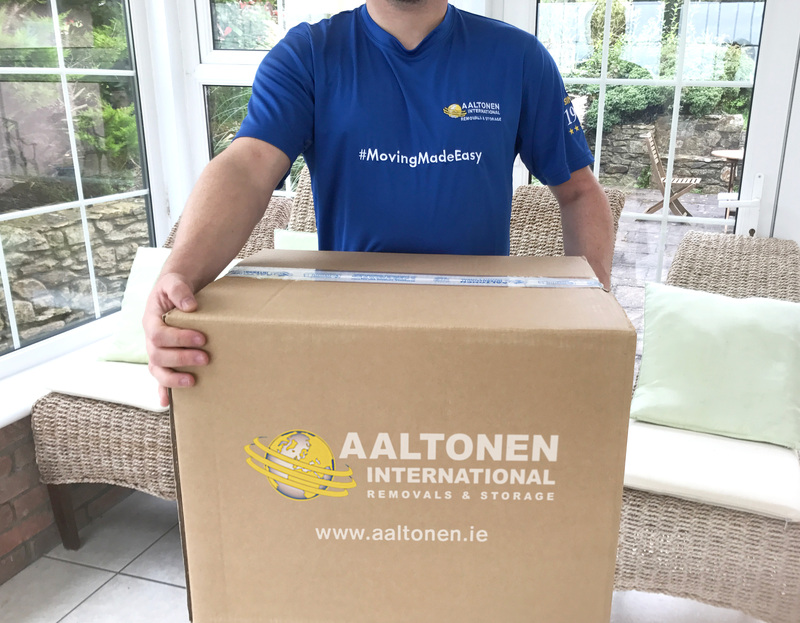 I certainly found when I started doing house and office removals in Cork with Aaltonen Removals, that it was a breath of fresh air. Especially compared to my monotonous 9 to 5 routine before that. Of course, that line of work suits some people perfectly but for people like myself, we simply cannot sit still in one place for longer than 30 minutes. I have got to be active. I find it soothes and calms my overall mood and allows me to operate with a clear mental focus. So if you are of a similar genetic makeup, then I urge you to consider becoming apart of the Aaltonen family. What challenges come with the job? Apart from the physical aspect, there is a lot of problem-solving involved. You must have intense vivid spatial awareness and imagination. Also, a certain degree of creativity. And you must be a master at (real life) Tetris. This work will remap the parietal lobes of your brain to transform you into a spatial-cubic-filling-solution-simulator machine! Although not near as a robotic as that sounds. Think of it as updating your internal software. At Aaltonen, everyone one of our staff has a heart, and we are acutely aware of the stress our clients are under during moving. You must be kind and be caring for our customers and strive to eliminate any stress and worry they may endure during their moving process. A little kindness and understanding go a long way in this business. As for our drivers, they are all driving with Full Clean Irish driving licenses. They have pinpoint accuracy when negotiating a slender driveway or our customer’s newly sown lawn. All of our drivers adhere to the rules of the road and travel with the same care and attention they would treat their own belongings with. If you are aspiring to progress within the company then we will guide and help you in any way we can to fulfil your potential and your ambitions. Travelling long distances and discovering new places is second nature to our drivers and porters. Should you wish to travel, expand your horizons and meet new faces, then this may be the career for you. What about office admin positions? Again, we are always looking to bolster our reputation as one of Ireland’s premier moving companies with the most diligent and industrious office staff available. Our Move Co-Ordinator’s and Surveyors work in tandem to provide our customers with detailed and timely information. We cater to our clients every need from the first phone call, to the final call wishing them every happiness in their new home or premises. The offices at Aaltonen International Removals & Storage are a hub of every day, constant, buzzing activity. The staff here are the heartbeat of Aaltonen. The office staff is driven, attentive, courteous, knowledgeable and above all understanding. We depend on our guys to provide the customer with the utmost assurance and dependability. They then relay meticulously detailed information to the crew members on move day. So if this sounds like you, why not join the team? How do you apply for a position? Simply send us an email at info@aaltonen.ie titled Job Application with your up to date CV attached. If we deem you to be a standout candidate then we will invite you to our depot for 1st round interviews. Part-time positions are also readily available but must maintain a flexible work schedule. Feel free to visit http://aaltonen.ie/ for more information.